Moles Acre01263 715779work01603 870304fax Self-cateringMoles Acre is a spacious family home, that is south and west facing and surrounded by an acre of gardens. 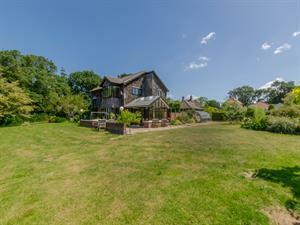 The property is secluded and tucked away with views over the surrounding Broads countryside, whilst still being only half a mile from the delightful small town of Loddon. A lovely house to relax and escape the world for a while it is also suitable for those who are less able with a ground floor bedroom and wheel-chair friendly wet room on the ground floor. There are a further 4 bedrooms, an en-suite shower room and a family bathroom on the floor above. The location is near to boat hire on the River Chet, a short drive to the stunning east coast beaches and less than 20 minutes from the cultural and retail delights of Norwich. • Beds: 1 zip and link twin beds which can convert into super king, 3 super king zip and link which can convert into 3 ' twin beds, 1 Single, 1 Single with an under bed. • Other: Towels, Books and Games, 2 Stairgates, Travel Cot, Highchair. • Notes: Please request the make up of the zip and link beds, as needed, on booking. There is a mobile ramp suitable for wheelchairs to get in and out of the property and the whole of the ground floor is on one level. The owner provides a pack of their own made ‘No Porkies’ sausages upon guests’ arrival. Moles Acre offers weekly bookings starting on Saturday. Moles Acre is a spacious family home, that is south and west facing and surrounded by an acre of gardens. The property is secluded and tucked away with views over the surrounding Broads countryside, whilst still being only half a mile from the delightful small town of Loddon. A lovely house to relax and escape the world for a while it is also suitable for those who are less able with a ground floor bedroom and wheel-chair friendly wet room on the ground floor. There are a further 4 bedrooms, an en-suite shower room and a family bathroom on the floor above. The location is near to boat hire on the River Chet, a short drive to the stunning east coast beaches and less than 20 minutes from the cultural and retail delights of Norwich.